‘Vote 100’ and the centenary of some women gaining the vote have seen the profile of Jessie Boucherett being raised in her home county of Lincolnshire this year. 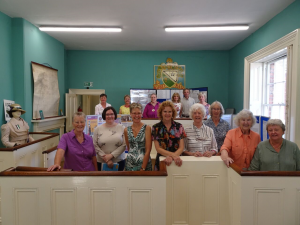 During the summer the town of Market Rasen, which is near to Jessie’s family home at North Willingham, hosted an exhibition in its Old Magistrate’s Court which showcased the work of Jessie and her sister Louisa. The exhibition was collaboration between the Town Council, Rase Heritage Society, Fawcett Society and University of Lincoln. Angela Wilson, Anne Egglestone and Angela Stubbs of the Fawcett Society undertook all of the research for the posters on the life of Jessie, helped with information from our book “Timely Assistance”. On 7 August a private viewing of the exhibition was organised and Dr Anne Bridger (co-author of “Timely Assistance”) and our Secretary, Jane Hampson, were invited along to take part in a post-viewing informal discussion. After the invited guests had had a chance to read all of the information about Jessie and Louisa, everyone sat down over drinks and cakes to hear more about the life of Jessie and the current work of Futures for Women. A local photographer came along to capture the event and excellent coverage of the exhibition was gained in the local newspaper. The exhibition has proved very successful in drawing people in from Market Rasen and Lincolnshire and has received lots of positive comments. It is planned to take the exhibition on the road in the Lincolnshire Wolds and more work will be done on researching other influential women in a wider geographical area. The photograph below shows Dr Anne Bridger (fourth from right on the front row) standing next to Jane Hampson in the Old Magistrate’s Court.